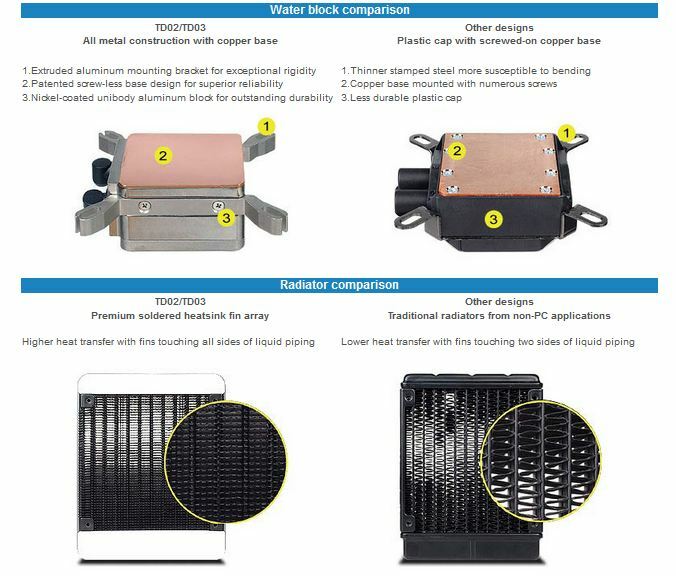 Tundra Series includes all-in-one cooling solutions, at the moment are available two models: TD02 and TD03. TD02 has a 240mm radiator, while TD03 has a 120mm radiator. On both models, the waterblock has a copper base and aluminum body. Oh lord jesus it`s my cooler! What do you like? The aluminium? The aluminium and the white parts are nice. Also the design and the shape of the radiator and the cooling block. The Tundra is really nice, but if feel a bit ... well ... pissed. I was looking at that thing back at CeBIT and was talking with SilverStone people that first of all I like it very much. Apart from that I told them to send a sample as soon as they have them ready and they went on yes. Well, obviously they forgot about it but sometimes I really don't like it when manufacturers always forget to whom they want to send something. Under the hood, I think that is the same CoolIT that we know very well. If I remember right, square block = CoolIT & round block = Asetek. Radiator is a bit different and obv the "cover" of the pump. It's not a CoolIT. It's SilverStone's own development.